An overnight horseback adventure in the Coast Mountains is something everyone should do at least once, especially beginners. It is the trip of a lifetime! But searching for the perfect horseback riding vacation for a beginner can be hard work as most horseback riding tour companies save the more adventurous and exciting rides for experienced riders. Meaning that beginners who are eager to get out riding and learning often get stuck on short pony treks. Our solution: at Copper Cayuse Outfitters, when designing our horseback riding vacations for beginners we take into account not only your riding experience and skill level but also your enthusiasm to learn and how much you'd like to progress. Are you a beginner planning a trip or are you planning a group trip with people of different levels of experience? Below are a few helpful tips to help you plan the best trip ever! If you're looking for a beginner horseback riding adventure that will leave you in love with the mountains, travel by horseback and the life of a mountain cowboy/girl, then we've got what you need. We've planned lots of group trips over the years with wide ranges of ability and experience, and the most fun groups have been when everyone agrees on what they expect from their ride. Those expectations can be a simple as spending quality time with friends and family doing something new together. Or, riding a specific piece of terrain or seeing certain sights and landmarks. We've seen groups of friends made up of advanced and beginner riders that have had a fantastic time together because they were all looking for a relaxed sightseeing ride. And, on the flip side, we regularly get beginners that are keen to progress and push themselves over multiple days with a group of intermediates. Attitude and personality matches are as important as matching skill. Our favourite rides for beginners are full day or overnight horseback riding trips. If your bottom isn't used to being in a saddle these longer rides give you the flexibility to take the day leisurely, leaving plenty of time for photography, lake breaks, and rest stops at beautiful vistas. Overnight horseback rides are a great way to cover longer distances and see more Canadian wilderness than you would on an ordinary hike. Another reason we love full day rides for beginners is that you have time to build a genuine bond with your horse. This is especially true on our overnight horseback trips where riders will be partnered up with the same horse for 3 days. Just like making human friends, the more time you spend with someone the better you get to know them and trust them. On our overnight trips the horses stay with you at base camp so there is plenty of time before dinner for you to learn how to unsaddle your horse, brush, and feed them. As a beginner, the temptation can be to first dip your toe in on just a half-day horseback riding trip. But, if we've learned anything from our beginner guests over the years that we'd like to pass on to you it's this: at the end of the 3 days almost all say "I'm so thankful that we did the extra days, it's great to get right back on the horse the next day and feel like I'm getting better and more comfortable". You will intuitively pick-up and learn so much more simply by spending consecutive days on a horse travelling together. Planning the perfect beginner horseback riding vacation doesn't have to cost the earth. It also doesn't have to be complicated or involve lots of travelling back and forth between riding days. 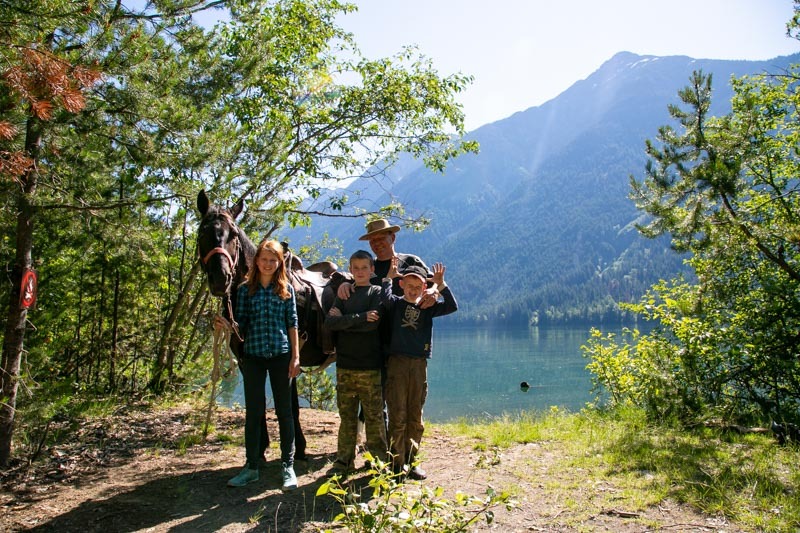 On multi-day horseback riding trips like our historic gold mine expedition guest, horses, cowboys and cowgirls all sleep at our base camp near Birkenhead Lake. Each guest or couple has their own accommodation and we'll bring in your luggage and creature comforts ahead of your arrival at camp. 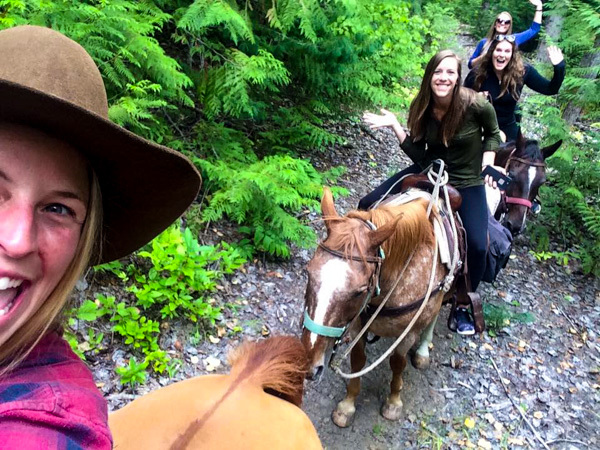 Whether your a beginner looking for a solo horseback riding vacation or a group looking to book a unique and fun getaway near Whistler. We'd be delighted to create the perfect trip for you.